About twice a year I get this romantic notion that I am going to bake bread. Which is hilarious because I'm scared of bread... scared of failing. I have baked a lot of bread and it's either dry or the crumb isn't right or it's too heavy like a brick. But a couple times a year I get a bug in my bonnet and want to bake bread. I will be baking in my immaculate kitchen on tiptoe. Singing with the bluebirds that a perched happily on the sunny window sill. Did I also mention I am 5'10" and am at most 125 pounds. Very Disney Princess. My glossy hair swings around perfectly with every movement but never is in my face. My house smells like bread fresh out of the oven. My kitchen is a mess. It's foggy and the birds are afraid of the cat. I am five foot nothing. Not close to 125 pounds. My hair is always in the way and getting grayer by the minute. And bread? Well I can never master the bread part. Let's see why because there are many reasons I fail and they are my own damn fault. -Heat. I keep my house cold in the winter. I'm talking the warmest it gets in my house is 65 degrees. The yeasties do not like cold. They want a nice warm environment. It has taken a lot of failed bread for me to get this one simple truth. -And last but not least. I hate instructions. Recipe schmecipe. I like to think of a recipes as a very loose guideline. When making bread you need to follow directions and this is where I fail. When I bake bread I need to follow the recipe. The person who wrote it knows what they are doing when it comes to bread and I, the most stubbornest person on the earth, needs to listen, read, and most importantly follow the recipe. Okay, class is session. Let's bake some bread. Ingredients first, then recipe instructions under each picture with my notes in italics. Lightly butter a large bowl and a bread loaf pan about 9 by 5 by 3 inches. 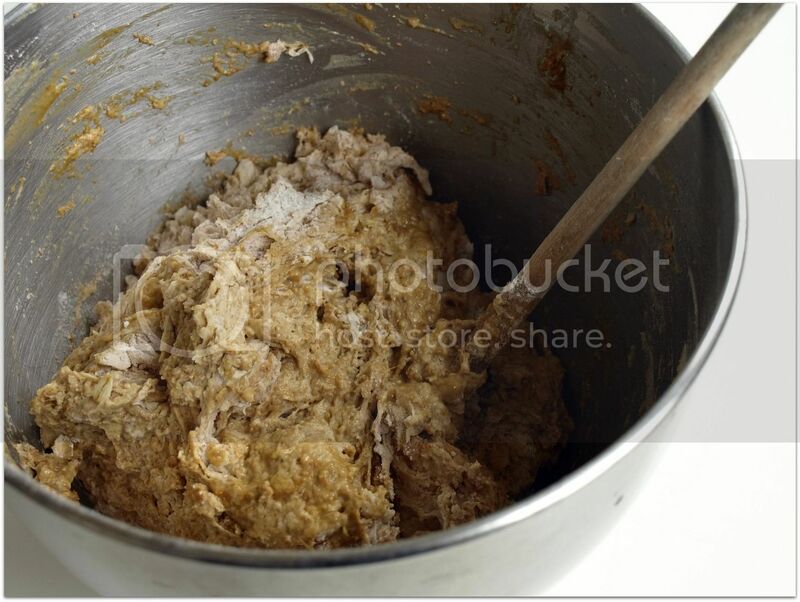 Add 2 cups of warm water, yeast, and molasses to the bowl of a standing mixer. Stir and allowing the yeast to bloom for about five minutes, until it begins to bubble.If it doesn't, it may be inactive; throw it out and start over. Warm water means 105-115 degrees. Too hot and you kill the yeast, too cold and the yeast will not activate. 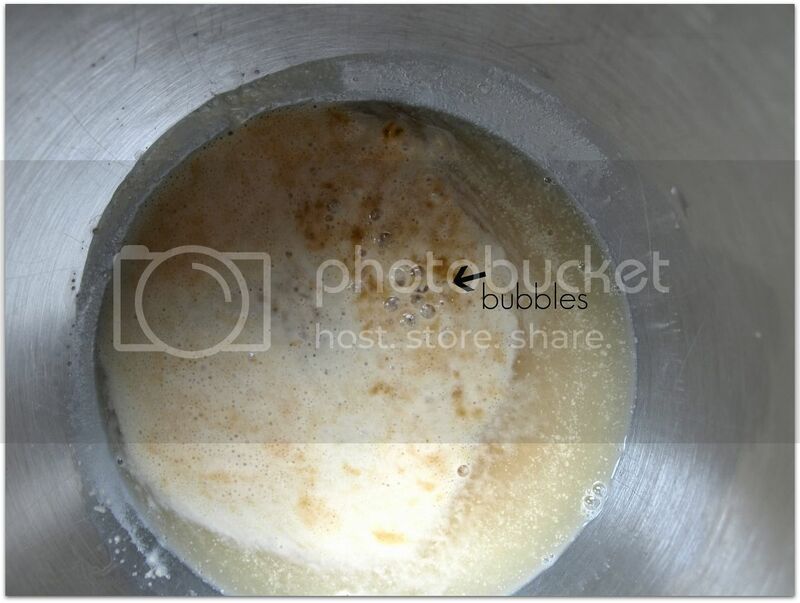 I also rinse my mixer bowl with warm water on the inside and outside, then dry before placing yeast and water into the bowl. Warm bowl and warm water makes the yeast very happy. 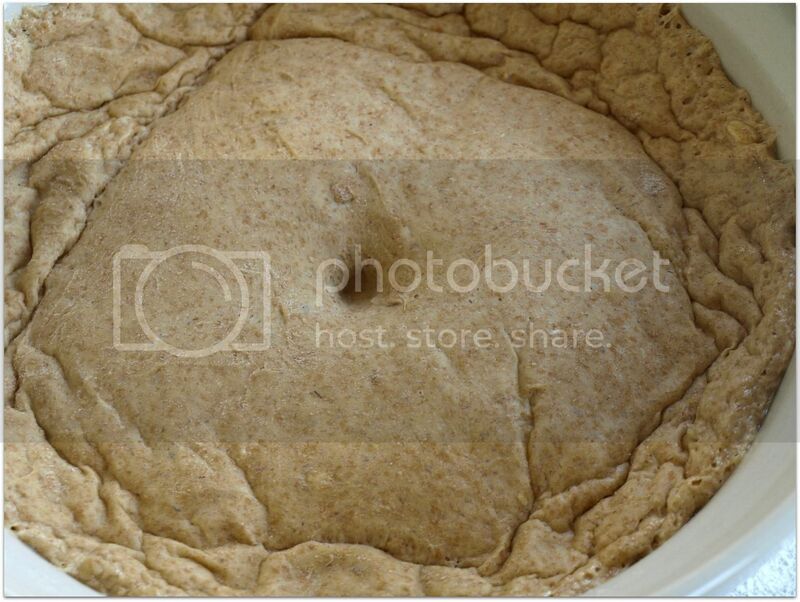 To autolyse, measure the flours oats, and butter into the bowl mixture with yeast mixture and stir together with a wooden spoon cover with a towel and let stand for 30 minutes. Autolyse means all the ingredients are mixed together except salt and then allowed to rest before kneading. 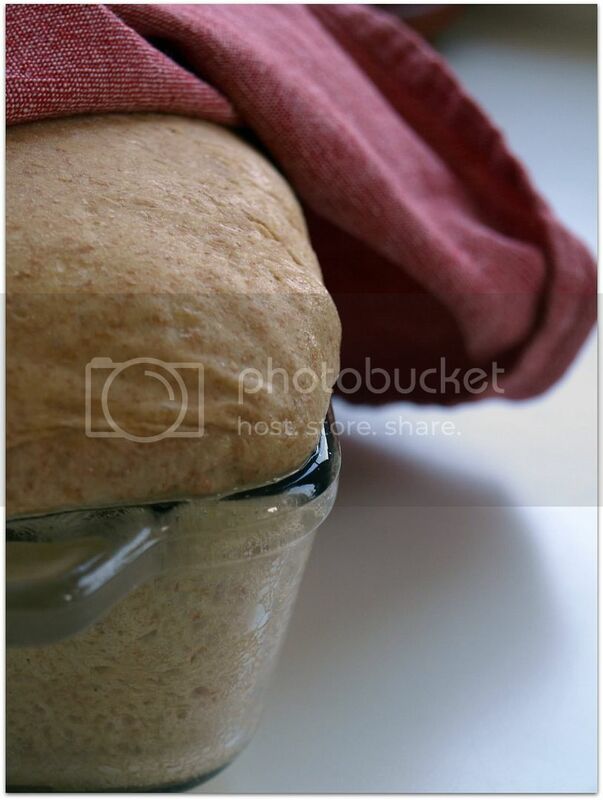 This rest allows the flour time to absorb the water, yielding a wetter dough and a moister bread. 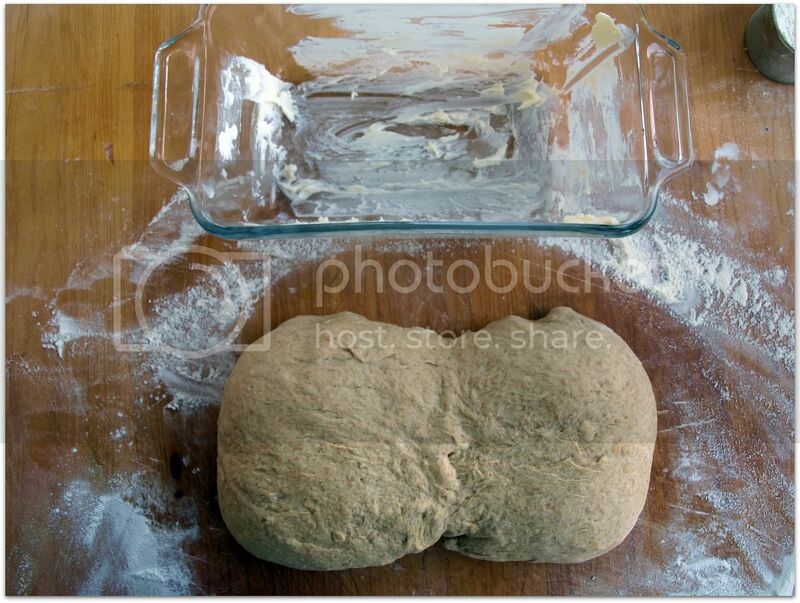 Since my house is cold, here's another tip to get bread dough to rise. I preheat my oven to the lowest temperature (170 degrees) for about five minutes. Then I turn off the oven and place my dough in the warm oven. Make sure not to heat your oven too much or it will kill the yeast also. Anytime the dough had to rest, I placed it in my warm oven. 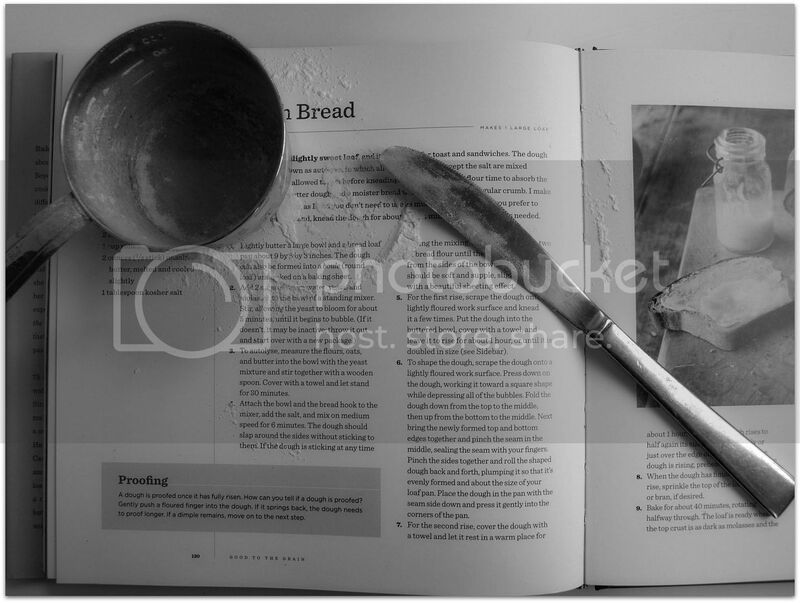 Attach the bowl and the bread hook to the mixer, add salt, and mix on medium speed for 6 minutes. The dough should slap around the sides without sticking to them. 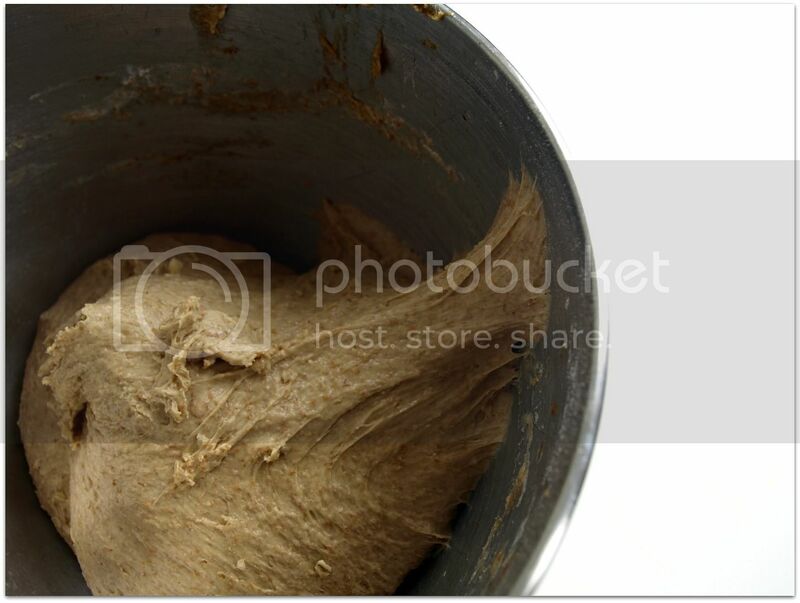 If the dough is sticking at any time during the mixing, add a tablespoon or two of bread flour until the dough comes away from the sides of the bowl. The dough should be soft and supple, slightly tacky, with a beautiful sheeting effect. My dough was perfect just like the above directions. When I stopped the mixer this sheeting (or what I think she meant by sheeting effect) happened. 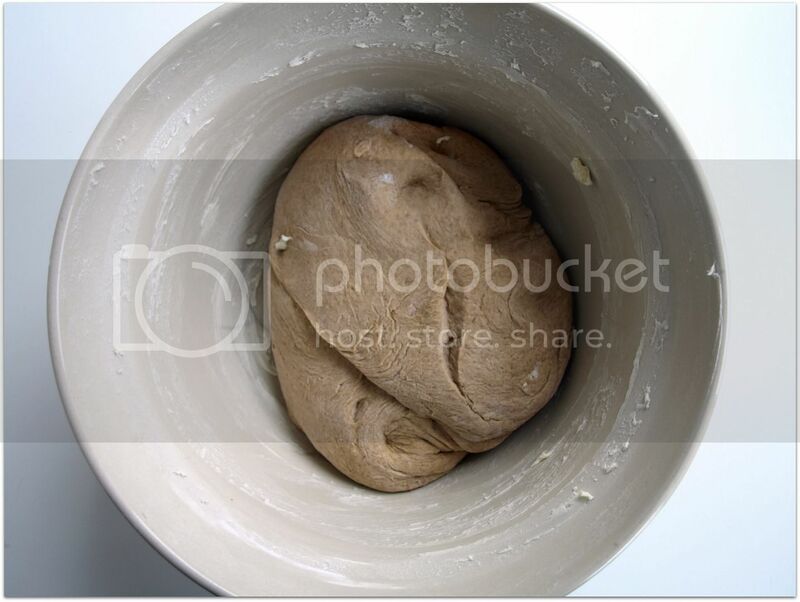 Then the dough pulled right back into the ball of dough in the bowl. 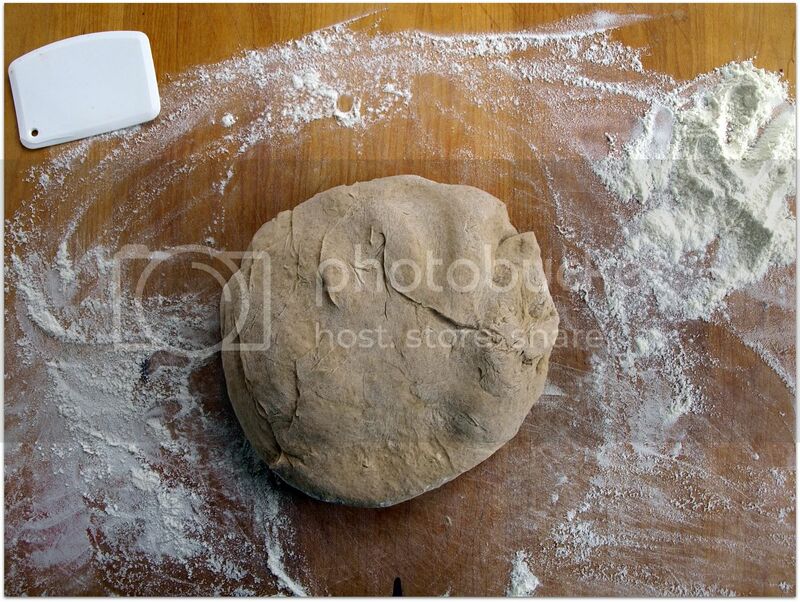 For the first rise, scrape the dough onto a lightly floured work surface and knead a few times. When I bake bread i always keep a little pile of flour the upper right hand side of my work surface just in case the dough starts to stick. Put the dough into the buttered bowl, cover with a towel and leave it to rise for about an hour, or until it's doubled in size. Again I leave the dough in my warm oven. How do you tell if it's proofed? 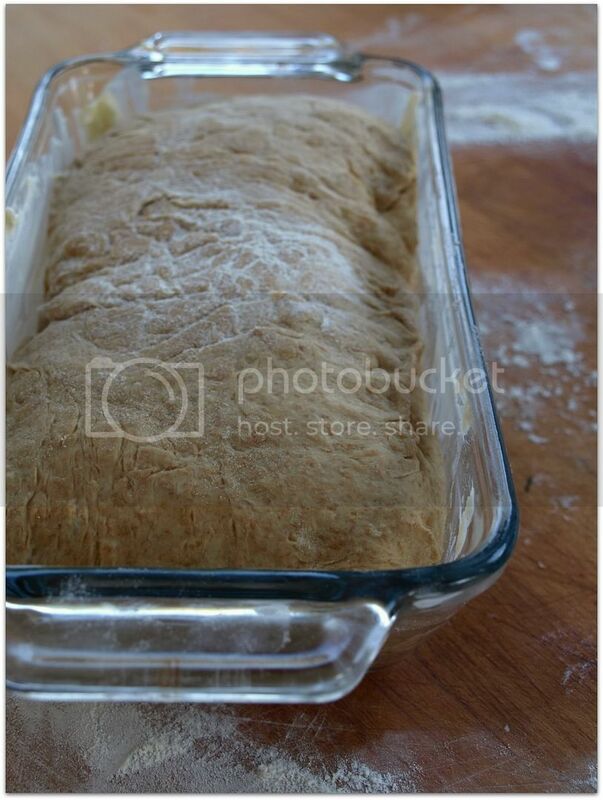 Gently push a floured finger into the dough. If it springs back, the dough needs to proof longer. If a dimple remains, move on to the next step. 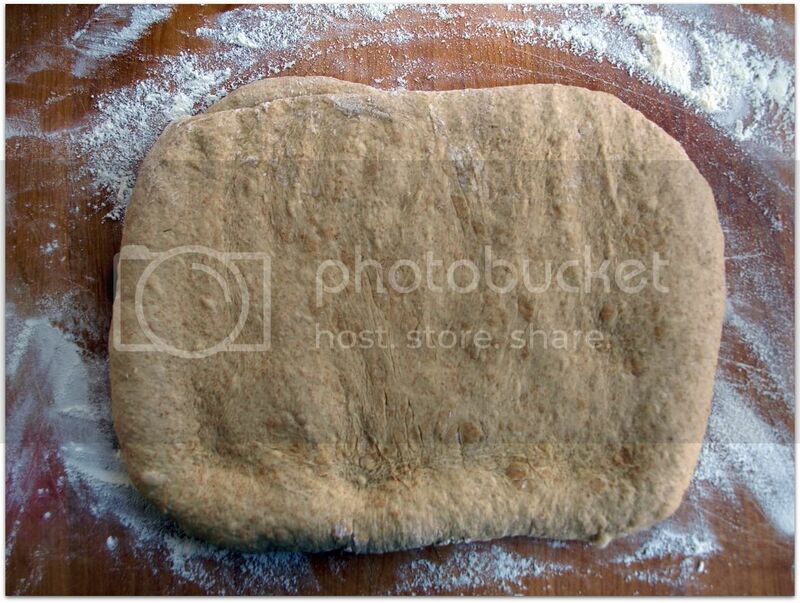 To shape the dough, scrape the dough onto a lightly floured surface. Press down on the dough, working it toward a square shape while depressing all of the bubbles. 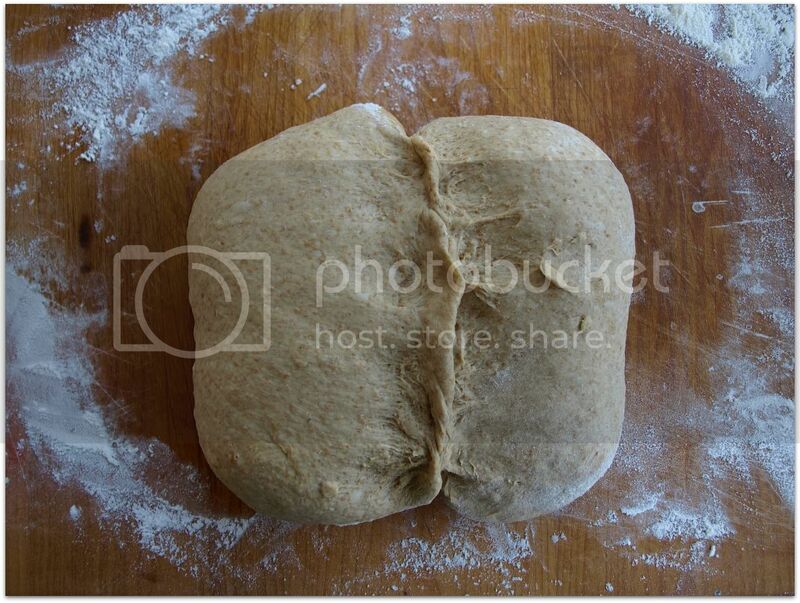 Fold the dough down from the top to the middle, then from the bottom to the middle. Next bring the newly formed top and bottom edges together and pinch the seam in the middle, sealing the seam with your fingers. Pinch the sides together and roll the shaped dough back and forth, plumping it so that it's evenly formed and about the size of your loaf pan. Place the dough in the pan with the seam side down and press it gently into the corners of the pan. For the second rise, cover the dough with a towel and let it rise in a warm place for about an hour, or until the dough rises to half it's size, or puffs up barely, or just over the edge of the pan. While the dough is rising, preheat oven to 400 degrees. When the dough has finished it's final rise, sprinkle the top of the loaf with oats or bran, if desired. Bake for about 40 minutes, rotating halfway through. The loaf is ready when the top crust is as dark as molasses and the bottom crust is dark brown. To see if the bread is ready, give the loaf a thump to see if it sounds hollow. If the hollow sound isn't there and the bread isn't dark enough, bake for another 5 minutes. Remove the loaf from the pan and cool on a baking rack, preferably for a few hours, so the crumb doesn't collapse when you cut into it and the flavor can develop. Tasting notes: I was thrilled with this bread. Slightly sweet, moist and bakery worthy. When and if my kids ever leave the house permanently, I will stop buying bread and make this my house loaf. Here are some other recipes that I lay out step by step... perfect french fries, tiramisu, gnocchi, pecan pie, cranberry streusel bars, brownies with caramel sauce, spam musubi, and dill pull apart rolls. Still here? Good. I was so happy the way that this bread turned out. I felt like a champ so I thought I'd spread the love. Want to win a copy of Good to The Grain? Leave as many comments here as you like or go click the like button on evil chef mom's facebook page and leave a comment there. Already a fan? You can leave a comment there as well. Winners will be announced Tuesday February 1st 2011. I have been trying to perfect my bread making skills lately. Would love to win a copy of this book. Thanks for the opportunity!! Your bread-baking daydream is the same as my bread-baking daydream. Except I'm 5'7". It would be too hard to find pants long enough if I was 5'10". I love that you have pictures of each step! Life is a little crazy right now, but as soon as it slows down a bit I plan on trying this recipe out. I too have always been nervous about bread making, but it's about time I give it a try! 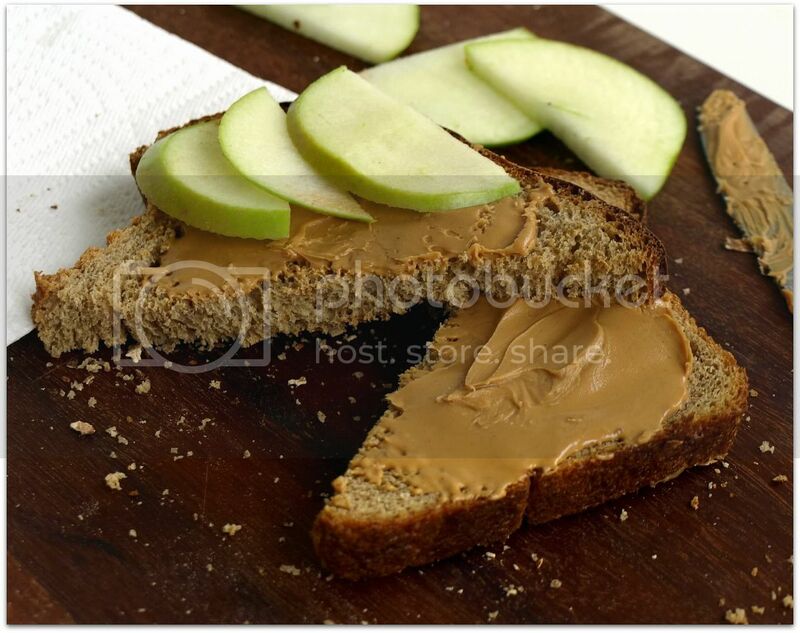 is it just me or is there a lot of stuff going into this 9x5 loaf? 4.5c flour+1c oats+2c water = 108 cubic inches. 9x5x3= 135 cubic inches. Yes i realize volumes are not additive but I'm using it to think about it nonetheless. The pictures don't look really dense or anything. is it? @me... There is a lot going on but it's not dense. I got a loaf with a beautiful crumb. I was surprised too. But I love the math geek in you! I'd love a copy of the book! 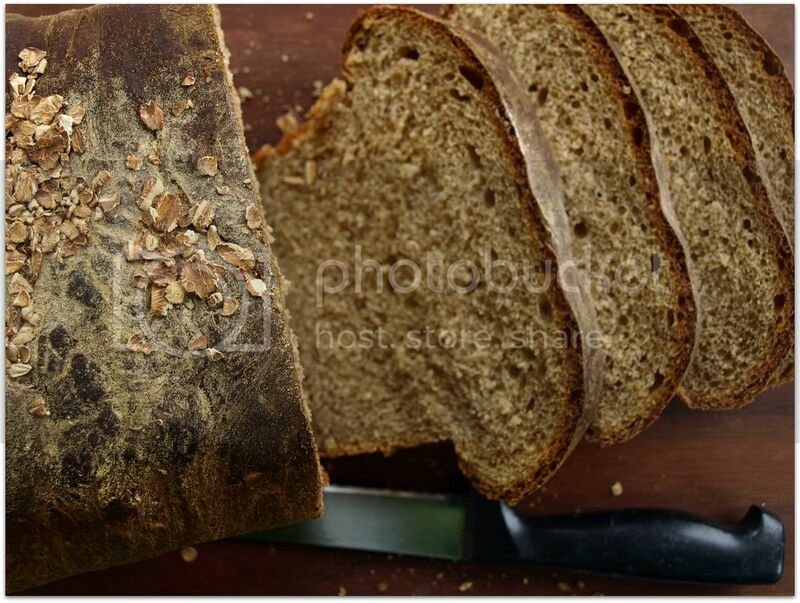 That oatmeal bread looks fantastic. Photos are fantastic here. This is the year I learn hot to make bread, as I, too, fear the yeast. Thanks for the inspiration. Now I'm putting my stand mixer to use.... 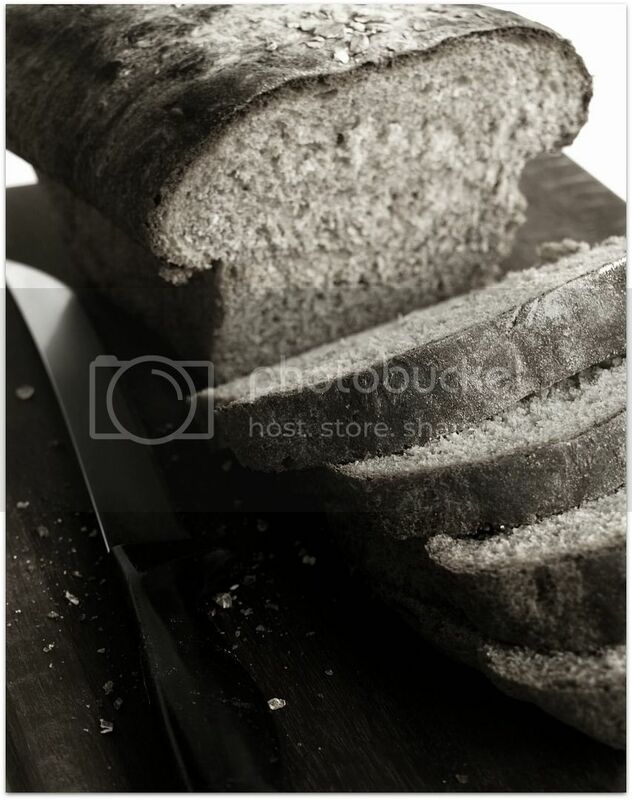 Very engaging post, makes me think I can tackle making bread! I am equally as scared as you are about making bread... So I'm excited to have a chance to win a book to help me! This bread looks so good! Can't wait to bake some. A cookbook win would be even better to make other types of bread as well. Thanks for the chance. Love your recipes and love your humor. I'm 5 ft. nothin' also. I am also scared of bread. PS: Disney Princesses spread bad body images and unrealistic life goals into our youth culture. You beat a Disney Princess any day. Your step-by-step photographs are wonderful. Very well done. An easier way to make bread is to use the no-knead technique that some new cookbooks have revived. Artisan Bread in 5 Minutes is a good one and the recipes work flawlessly. This bread looks and sound delicious as does the cookbook. Your thoughts on recipes and baking are my thoughts exactly! This bread looks amazing. Love this post. I also try to perfect my bread making skills on a fairly regular basis. I love the idea of happy birds sitting on the windowsill watching me. :) Too funny. Like you, I have Issues with bread. This was not such a problem when I was the only one in the house eating bread, because then I felt no need to be making it. But I now have a child who absolutely LOVES toast, so it's time for me to get over my bead issues and start making him bread. Motherhood is all about sacrifices, right? Also, I understand your issues with the heat. Isn't it kind of depressing when you realize your house is too cold to make yeast happy? Maybe a good rule of thumb is that if it's warm enough for happy yeast, it's warm enough for happy people. As far as I'm concerned, if the bread doesn't turn out right it's the recipe, not the cook! I'd love some new bread recipes. Thanks! I've always been a little leery of baking bread, but you made it look easy! This past year I started making bread for the first time. I LOVE it! and so does my family! Really, what beats fresh-from-your-oven-homemade-bread?? Not much. I really love the Artisan Bread in 5 minutes a Day. Have you tried it? oh, PS, if you haven't tried the bread in 5 minutes a day yet, you might love it. You put the yeast in...and don't have to wait for any magic to happen. It just works-over and over again! You can even toss together all the ingredients and let it rise in the fridge all day. Foolproof! @cassi... i will try that one next!